For the science fiction novel with the same name, see Incandescence (novel). "Incandescent" redirects here. For the album by Crumbächer, see Incandescent (album). Hot metal work glows with visible light. This thermal radiation also extends into the infrared, invisible to the human eye and the camera the image was taken with, but an infrared camera could show it (See Thermography). The incandescent metal embers of the spark used to light this Bunsen burner emit light ranging in color from white to orange to red or to blue. This change correlates with their temperature as they cool in the air. 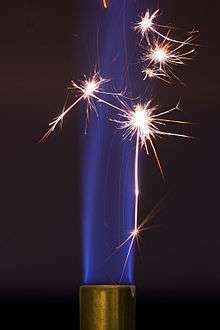 The flame itself is not incandescent, as its blue color comes from the quantized transitions that result from the oxidation of CH radicals. Incandescence is the emission of electromagnetic radiation (including visible light) from a hot body as a result of its temperature. The term derives from the Latin verb incandescere, to glow white. Incandescence is a special case of thermal radiation. Incandescence usually refers specifically to visible light, while thermal radiation refers also to infrared or any other electromagnetic radiation. For a detailed discussion of the intensity and spectrum (color) of incandescence, see the article: thermal radiation. In practice, virtually all solid or liquid substances start to glow around 798 K (525 °C) (977 ˚F), with a mildly dull red color, whether or not a chemical reaction takes place that produce light as a result of an exothermic process. This limit is called the Draper point. The incandescence does not vanish below that temperature, but it is too weak in the visible spectrum to be perceivable. At higher temperatures, the substance becomes brighter and its color changes from red towards white and finally blue. Incandescence is exploited in incandescent light bulbs, in which a filament is heated to a temperature at which a fraction of the radiation falls in the visible spectrum. The majority of the radiation however, is emitted in the infrared part of the spectrum, rendering incandescent lights relatively inefficient as a light source. 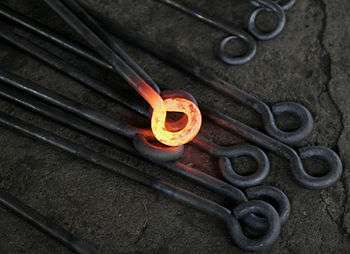 If the filament could be made hotter, efficiency would increase; however, there are currently no materials able to withstand such temperatures which would be appropriate for use in lamps. More efficient light sources, such as fluorescent lamps and LEDs, do not function by incandescence. Sunlight is the incandescence of the "white hot" surface of the sun. The word incandescent is also used figuratively to describe a person who is so angry that they are imagined to glow or burn red hot or white hot. ↑ Dionysius Lardner (1833). Treatise on Heat. Longman, Rees, Orme, Brown, Green & Longman. The state in which a heated body, naturally incapable of emitting light, becomes luminous, is called a state of incandescence. ↑ John E. Bowman (1856). An Introduction to Practical Chemistry, Including Analysis (Second American ed.). Philadelphia: Blanchard and Lea. ↑ William Elgin Wickenden (1910). Illumination and Photometry. McGraw-Hill. ↑ Example 1:'...the stadium positively crackled with the incandescent anger of anguished supporters.' Mark Wilson, 'Rangers 1 Unirea 4', Daily Mail, 21 October 2009 . Example 2: '...there's something very funny about incandescent anger.' Mark Fisher, 'Jerry has a cross to bear', The Scotsman, 5 March 2006 . Figurative use: Rangers 1 Unirea-Urziceni 4 etc. This article is issued from Wikipedia - version of the 9/24/2016. The text is available under the Creative Commons Attribution/Share Alike but additional terms may apply for the media files.